Vibration Amplification of Sound Energy at Resonance aka Vaser Lipo is a revolutionary new technique used for fat removal and contouring areas of the body. The advantage of Vaser Lipo technology is that it allows the extraction of bodily fat but leaves other connective tissues intact, which gives much smoother end result, with less bruising. The system has a range of purposefully designed probes and precision cannulae that can be used to treat different areas of fat, thus meaning smaller delicate areas can be treated effectively as well as larger bulky areas. 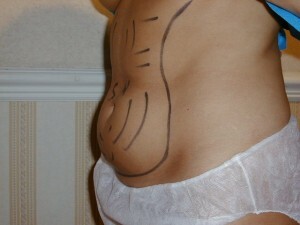 Traditional Liposuction uses a power suction technique, which affects other tissues such as blood vessels and nerves during the process. Whilst traditional liposuction is a hugely effective method of body reshaping, the Vaser technique is often preferred as it targets just the fat cells and is considered to produce superior end results with smoother, tightening of the skin. What is the Vaser Lipo process? The first step of the Vaser Lipo process itself involves infusing the layer of fat with a fluid. The high frequency vibration probes are then used to break down the fat cells that become emulsified in the fluid. The fluid containing the fat is then removed with suction and massage. Finally, remodelling the preserved tissues encourages the skin to retract and gives a smoother appearance. Which areas can be treated with Vaser? Face – Vaser is perfect for treating delicate, smaller areas on the face. Can the procedure be done under local anaesthetic? Vaser Lipo patients is often performed on a ‘day case’ basis as the procedure can be performed using local anaesthetic with the option of sedation. This means the patient can return home shortly after their treatment, which also helps to aid recovery. What are the benefits of Vaser Lipo, Liposuction and Liposculpture? Lipo – fat removal and body contouring – is used to refine body shape and eliminate stubborn areas of fat that can’t be shifted by diet and exercise alone. Many of us have areas on our bodies that we’d like to change – although it’s important to understand that all Lipo techniques are not weight loss procedures – if you don’t change your diet it is likely that you’ll gain weight elsewhere on the body. When considering body reshaping, Linia patients are encouraged to take a holistic approach and adapt their lifestyles to avoid gaining excess weight in other areas in the future. Vaser Lipo is also perfect for treating small areas such as a double chin or excess weight on the face – it gives fantastic results, within a short time and with a quick recovery, which is perfect if you’re considering facial rejuvenation but do not want the ‘down time’. What’s the cost of Vaser Lipo? Due to the nature of Vaser Lipo and the different areas that can be treated, it’s difficult to provide a list of prices. Consultations at Linia are free of charge and if you’re considering this procedure and you would like a price, you are more than welcome to come along and meet one of our surgeons, who will examine you and provide you with a price based on your individual needs. Procedures such as Vaser and other Liposuction techniques are performed to improve your body shape and help to refine your figure, which can produce excellent results. Patients who have had such surgery have commented how they are now more confident in themselves, have greater self esteem and find it easier to buy clothes that fit well. They are more body confident and no longer feel the need to hide themselves away in baggy clothes to cover up areas of their body they dislike. Patient expectation is very important and when considering Liposuction it’s important to understand what can realistically be achieved – as with any aesthetic procedure, a surgeon can only work with what is there and there are always risks involved and sometimes the possible need for refinement. At Linia our surgeons who perform Vaser Lipo are specialists in the technique and have performed the procedure on hundreds of patients, so you can be confident you’ll be in the best possible hands. Vaser Lipo is becoming very popular and we are pleased to now include it as a speciality in our wide range of aesthetic procedures. Please call us or fill out our contact form for a free consultation today.